Working with hundreds of satisfied and safe clients over the years has produced a lot of similar questions for Early Piety, owner of Specialty Tree Lightning Protection Services. Piety sat down with us to answer some common questions as we move into the typically stormy season. 1. What exactly is lightning protection and why do I need it? Lightning protection involves a complex, custom designed, system of air terminals as well as special conductor cabling, ground terminations, surge arrestors and bonds with metallic bodies, telephone, CATV, gas and water lines. According to Underwriters Laboratories, a properly designed and installed system is 99.9 percent effective as protection against lightning damage. Best of all, the systems generally require no maintenance unless the home or structure is changed structurally and mechanically. 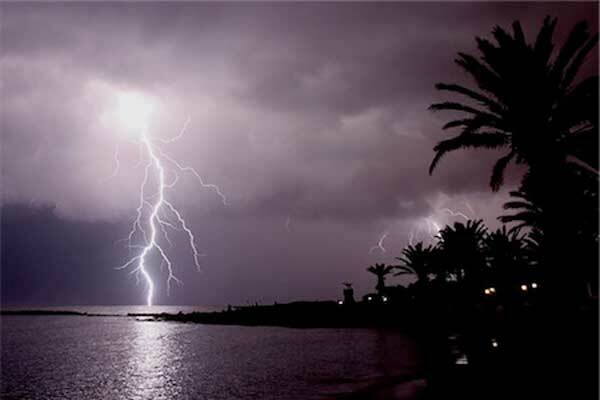 A single bolt of lightning can carry more than 30 million volts of electricity. It can rip through roofs, explode brick and concrete and ignite fires. In addition to personal physical damage, it can wreak havoc with computers, electronic equipment and appliances. Each year, thousands of homes and other properties are damaged or destroyed by lightning accounting for more than a quarter billion dollars in property damage annually in the United States. A lot of people don’t realize that lightning is responsible for more deaths and property loss than tornadoes, hurricanes and floods combined. 2. What should I do during a storm with severe lightning? The best thing you can do during a storm with severe lightning is to seek shelter. A general rule of thumb is to stay indoors at least 30 minutes after the last lightning strike in your area to be safe. Very rarely, a bolt can travel miles from an obvious storm and strike the ground so it’s always better to be safe than sorry. Lightning can and often does strike the same location more than once, since the attracting elements do not change from a given site. 3. Does a lightning protection system actually attract lightning? How vulnerable am I? No. A Lightning Protection System does not attract lightning. Through the Lightning Protection System, the destructive power of the strike is directed and dissipated safely into the ground, leaving the structure, family and equipment unharmed. Modern homes are more susceptible to lightning damage than ever. Metal building components, irrigation and security systems, invisible and electric fences, computers and sensitive electronic appliances are common in most homes and can increase a homeowner’s potential for serious lightning damage. Statistically, lightning strikes between 30 and 60 times a year within a two-mile radius of the front door of your home. And remember, Florida is the lightning capital of the United States. 4. What is most likely to get damaged when a bolt hits my house? Most likely, your electronics would be the first things to get damaged. Appliances, electrical systems and even the building construction materials are all at risk however. We recommend, if you do not have a full lightning protection system on your home, to plug electronics into surge protectors. It may cost a little extra, but the protection is worth it. 5. How noticeable is a lightning protection system? Today’s modern inconspicuous lightning protection systems are installed to blend in with the structure and materials of your home, making the system practically invisible from the ground. Often, visitors will never even know the system is there.